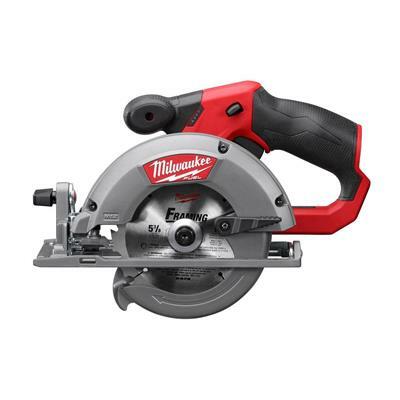 With a cut capacity of 1-5/8" for cutting 2x dimensional lumber, the M12 FUEL™ 5-3/8" circular saw, delivers up to 170 cuts per charge and up to 2X the motor life of competitive products. With the ability to cut a wide range of common jobsite materials, the M12™ circular saw was designed to deliver the power, run-time and durability required by professionals. The POWERSTATE™ Brushless Motor outperforms all leading competitors with constant power output, yet runs cooler with no wearable components. REDLINK PLUS™ Intelligence ensures optimized performance and protects your investment from overload, overheating, and over-discharge. The M12™ REDLITHIUM™ XC4.0 Battery Pack provides more work per charge and more work over the life of the pack than competitive batteries. The M12 FUEL™ 5-3/8" circular saw features a built in LED light for great cutline visibility and all aluminum guards and shoe for increased durability on the jobsite.